Rain Gardens, Rain Barrels and Bioswales - Oh My! As fall began, Snohomish Conservation District co-hosted many community events involving a variety of ages all over the district, and we were blessed with nice weather! We love to teach members of the community how they can protect natural resources including water and soil through simple actions like installing a rain barrel or planting a new rain garden. 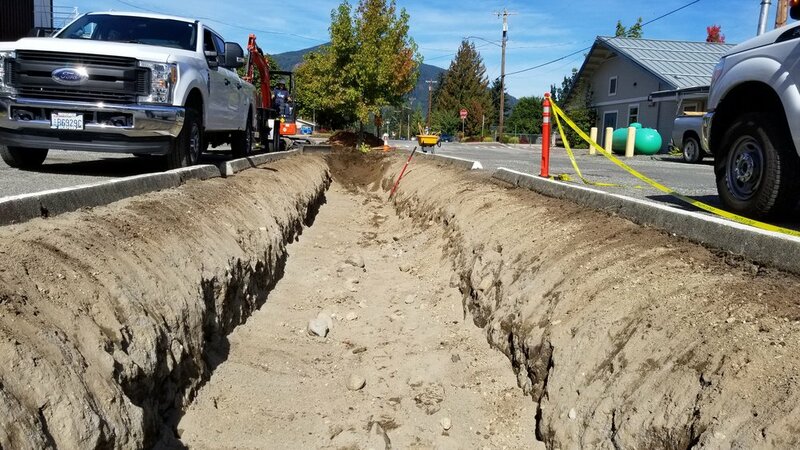 For those unfamiliar with the term bioswale, it is very similar to a rain garden, but they are located next to roadways designed to catch debris and filter pollutants out of stormwater from the street. 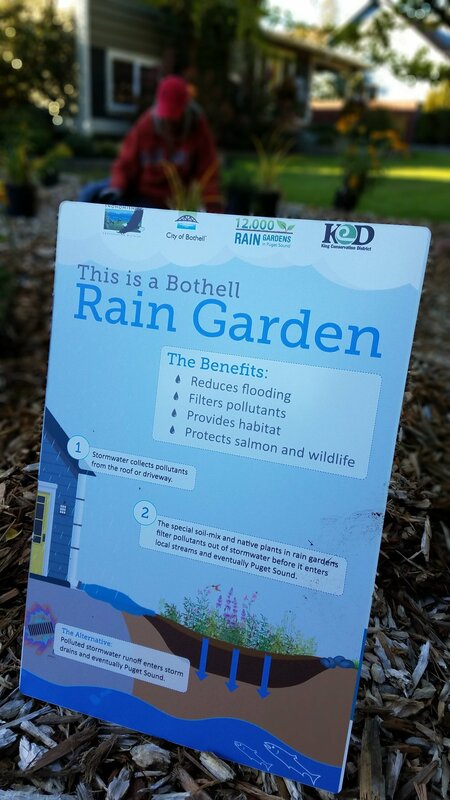 Rain gardens typically filter stormwater off of one’s roof or other non-permeable structures. 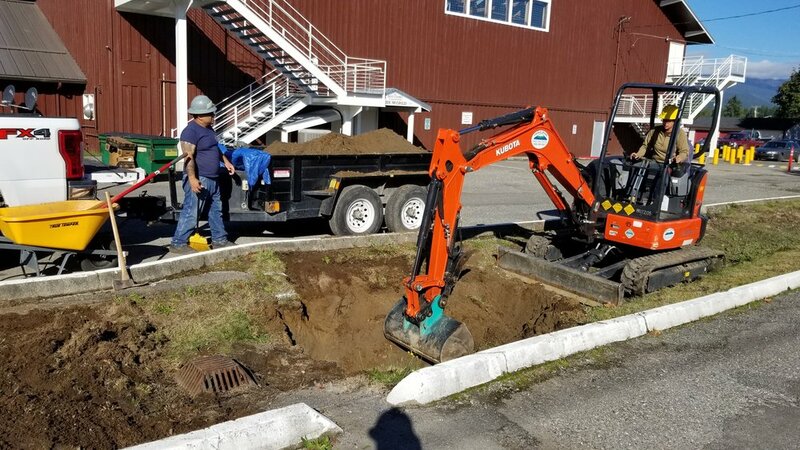 We partnered with the City of Bothell, their environmental arm Bothell Cool, Stewardship Partners / 12,000 Rain Gardens, and King Conservation District to build and plant four rain gardens in the neighborhood near the high school. Alicia Kellogg, one of our community conservation project coordinators, began the partnership, to “build momentum in the city for doing more projects like this.” Rain gardens are “cheaper and more beautiful” than other stormwater infrastructure, she said. Around 30 people showed up to plant the rain gardens and about half of those were students from Bothell High School. Community members in attendance learned how they might incorporate rain gardens into their properties. Photos courtesy of Christi Cox, City of Bothell. 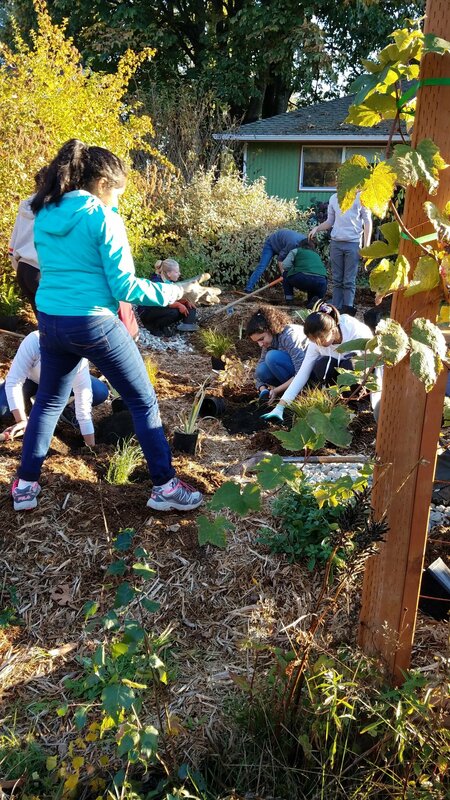 As part of the Puget Sound Starts at my School Program, SCD staff taught Darrington middle school students a series of watershed-focused engineering lessons that led to students designing a rain garden project for their school. 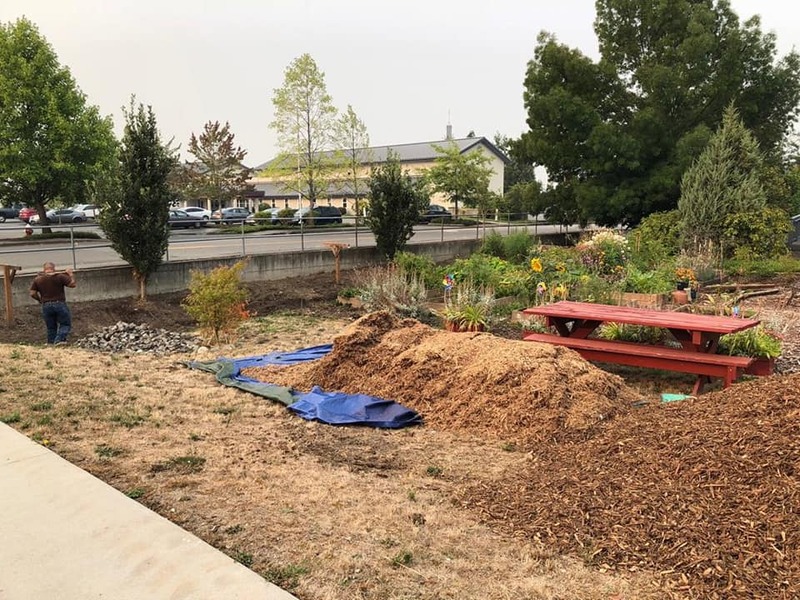 The rain garden is located in the parking lot between the Middle/High School building and the Community Center, which is a high traffic location in the town of Darrington. Our Veterans Conservation Corps constructed the rain garden and community members, Science club students and school staff helped plant the garden during a community celebration. Affordable rain barrels were on sale during the rain garden planting party to encourage local residents to do their part to protect local waterways. 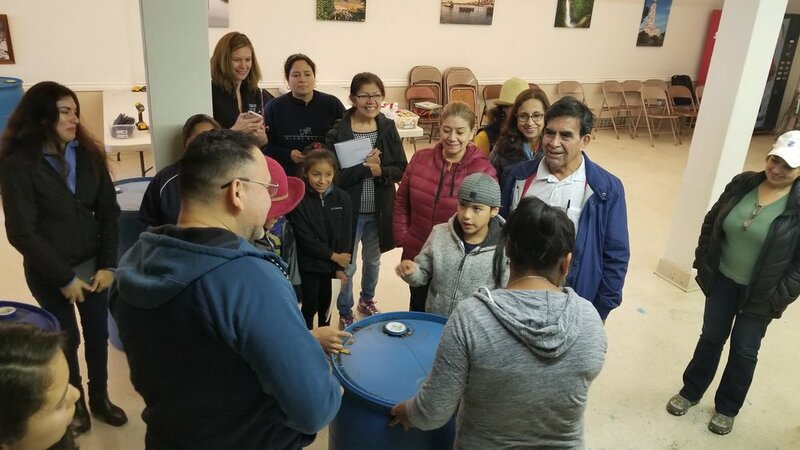 For this rain garden and rain barrel event, we were fortunate to connect with WSU for a class called Jardinería con un Propósito / Gardening with a Purpose taught predominantly in Spanish. Kate from our team, and Montan from In Harmony Sustainable Landscapes, instructed the group on how to build a rain barrel, which they got to take home, and what a rain garden is. The workshop was held at the Monroe Chamber of Commerce and their Executive Director Yvonne was so thrilled to have us there. Latinos represent about 20% of the ethnic minority population of Monroe so they are an important audience to reach. We were fortunate to have the right partners to help make this event possible. Photos courtesy of Yvonne Marisol Gallardo Van-Ornam and Chris Rodriguez. Bioswale time! 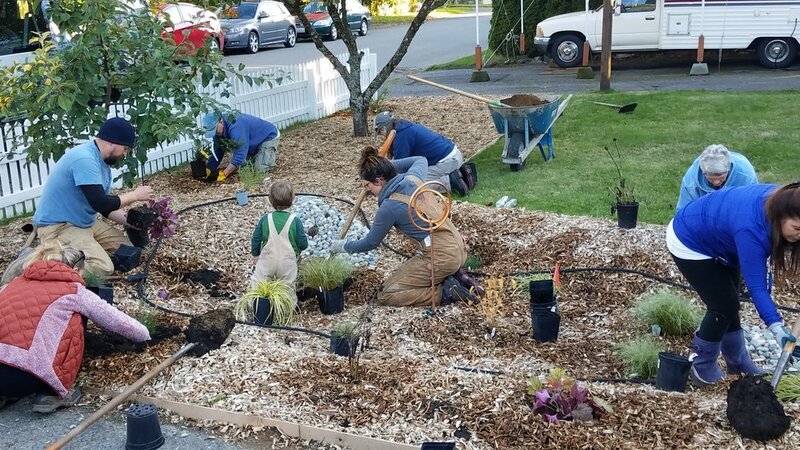 Some of our familiar volunteering faces made the journey to Stanwood for this bioswale planting at the Community Resource Center of Stanwood Camano on a sunny day in October. Typically, their swale would be “a big muddy ditch” come fall when the rains really kick in. 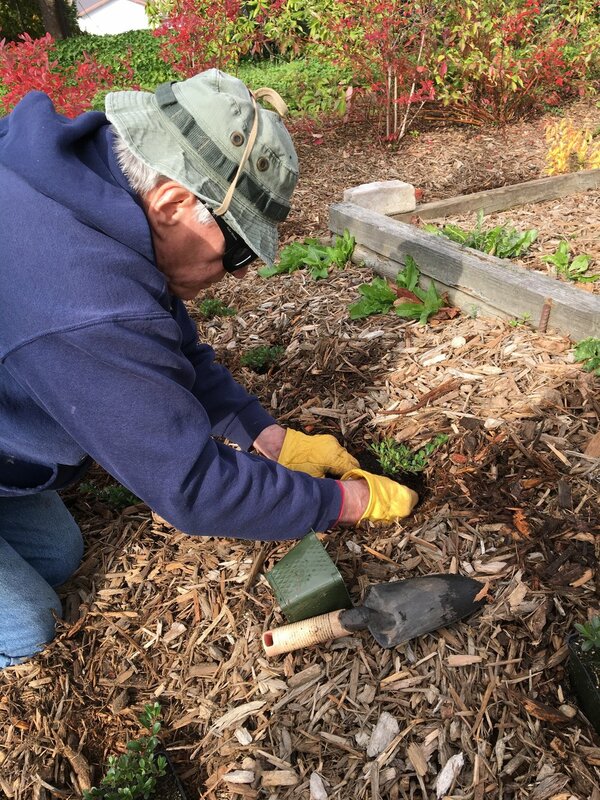 Our Vet Crew fixed up their garden beds and prepared the ground of the bioswale, removing less permeable soil. The Center thought our crew “was great to work with an did an amazing job!” On the day of the planting, these volunteers collectively planted 500 plants! Now, both the soils and the plants will help absorb that extra water and maintain the area during the wet fall and winter. Photos courtesy Community Resource Center of Stanwood Camano and Jill Farrant, SCD intern. Have an area at your home, your community center, business or school where you think a rain garden might be useful? Contact our Community Conservation team - ccteam@snohomishcd.org / 425-335-5634 to schedule a free site visit today!